When it comes to health, there is no downside to improving. Whether it’s eating healthier food, being more physically active, or trying to cut out other unhealthy habits, there is always a way we can be healthier. Although the decision to make healthier choices is ultimately up to each individual, there are ways that planners can make these choices easier for people to make. That is why planning and health professionals are working together more than ever before to encourage healthy community design. The Healthy Communities in PA task force envisions a Pennsylvania where every resident lives in a community designed for healthy living, where the healthy choice is the easy choice. This vision is achieved through volunteer efforts by planning and health advocates creating tools and resources to assist partners in promoting healthy community design. The tools and resources are created by working groups of task force topic experts that collect the best practices needed by Pennsylvania’s healthy community design partners. APA's Pennsylvania Chapter is committed to sharing these resources and facilitating discussion around healthy community design in Pennsylvania. We recently sent out a survey to the planning directors of each county in Pennsylvania. The survey was designed so that the Healthy Communities in PA task force could establish working groups on pressing issues and find a direction in which to begin working. The survey asked how each county regarded itself demographically and examined how involved these counties were in building healthy communities as well as what tools would be most helpful in learning about healthy communities. In order to learn more about healthy communities, planners believed that online training sessions would be the most helpful, accompanied by model resolutions or ordinances and white papers or research documents. The chart summarizies Planners4Health survey results, showing which issues are most pressing to county planners and which issues planners believe they can change. Image courtesy Healthy Communities in PA Task Force. When asked how familiar counties were with the concept of healthy communities, most answered that they were somewhat familiar with the idea, meaning they are familiar with the notion but they do not regularly promote the concept. Many others said that they actively promote the idea of healthy communities, while very few are planning to implement healthy community ideas, are unfamiliar with the concept, or found that healthy communities do not relate to their goals. Through the survey of county planning directors, the chapter's Healthy Communities in PA task force is working to provide tools to planners to help make the healthy choice the easy choice in Pennsylvania’s communities. Through the task force website, we are providing the resources that county planning directors identified as most useful in encouraging healthy community design, highlighting upcoming webinars, training, and in-person meetings around Pennsylvania. Healthy Communities in PA task force has also created working groups to dive into the top issues related to healthy community design in Pennsylvania. The working groups are designed to be adaptable to member needs while calling on the resources of the full Healthy Communities in PA task force for additional resources or expertise. Healthy Community in PA task force is also coordinating with Pennsylvania agencies and departments to further healthy community design. 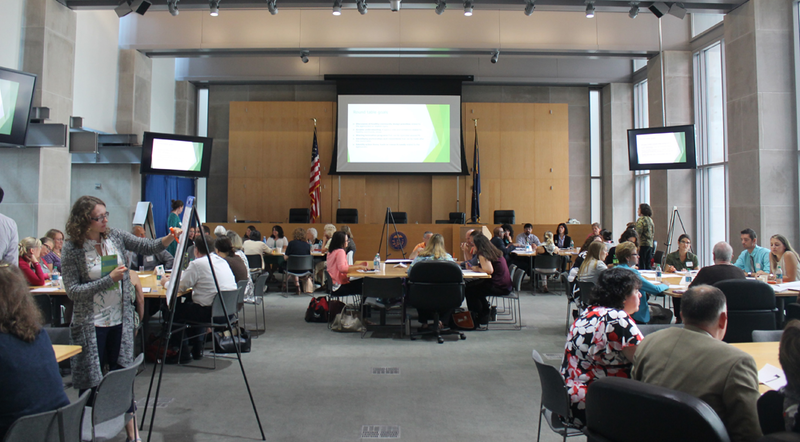 We held a joint round table with the Pennsylvania Interagency Health Equity Team in August 2017 at which agencies shared the work they were doing and collected additional input from health and planning partners. Additionally, the task force will be assisting the Pennsylvania Department of Health’s Live Healthy PA database to add more healthy community design related projects and programs. Planners4Health roundtable in August 2017. Photo courtesy Healthy Communities in PA Task Force. The task force website is a way to find out how you can help make communities around Pennsylvania healthier by design. Check out our website by searching “Healthy Communities in PA” and use the resources provided to use healthy design concepts in your projects and work, give a presentation or training at a local level, or join or start a working group on a topic of interest to you. The original version of this article appeared in the APA Pennyslvania Chapter’s Fall 2017 Vantage Point Newsletter. Top image: The Chestnut Hill neighborhood in Philadelphia was selected as a Great Place in 2012. Gingko trees are planted in the neighborhood's commercial district along Germantown Avenue, which still has some of its original granite block paving. Photo courtesy Philadelphia City Planning Commission. Justin Dula, AICP, is currently the community and regional planning section manager at the Delaware County Planning Department (DCPD). He became a board member of the Delaware Valley Smart Growth Alliance after acting as the government caucus chair for several years. Dula is currently treasurer of APA's Pennsylvania Chapter and chair of the chapter's Southeast Section.